The Xenon Lamp is replaced after 2,000 stamps have been made. 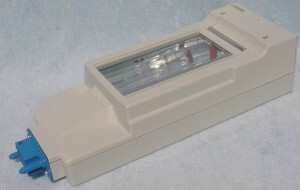 Your SC-2000 machine will alert you when it is time to replace the lamp. You can check the counter on your machine to see if it is time is drawing near to order a Xenon Lamp. Press the "mode" button on the top panel three times. The display will say "reset counter." Then press "set." You'll see how many stamps your machine has produced. Press "set" again to clear the display.